Can you ever fold pocket aces at the poker table and not feel like throwing up? While many will assume the answer is no, it is in fact: yes. Granted, the times you’ll need to fold pocket aces pre-flop whilst you play poker will be limited, however, there is one situation and that’s during a satellite. Satellite tournaments are low buy-in events that allow you to win entry to a much more expensive one. In these games the aim is not to win every chip and claim top spot but to survive long enough until the payouts start. This dynamic means that you don’t have to play as aggressively as you do in a standard tournament. Because you don’t have to take as many risks there are times where you can fold your hand; even if it’s the best pre-flop holding in poker. Consider this scenario: you’re on the bubble of a satellite and have the second largest chip stack. 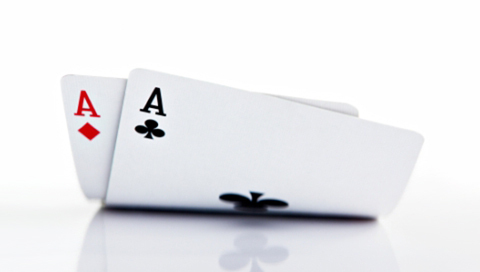 The player with the most amount of chips moves all-in and you look down at pocket aces. Behind you there are three players who all have 10bbs or less and are on the brink of elimination. In this situation should you call? The logical and most obvious answer is: no. In this situation there is no need to gamble as everyone who reaches the payout spots wins the same prize, thus, it doesn’t matter if you win all the chips or not. Indeed, because you have a strong stack and those around you are weak it means you can sit tight and wait for someone else to bust. Moreover, because the player who has moved in is the only one who can eliminate you it makes it all the more important to fold. Thus, while it’s not normal to fold pocket aces pre-flop, the situation above dictates that it’s the right course of action and something you should remember when playing in a satellite.